View More In Fermentation & More. - 2 x Breathable cotton 8"x8" muslin jar cover for use when brewing (you don't want to use cheesecloth as bugs can't get through the cloth--this is muslin cloth suitable for letting only air through! - 2 x Plastic screw-on lid that is great for using when not in use, or to store your brew in the fridge or to transport it. The plastic lids have a removable liner that creates an airtight and leakproof seal. Capacity 1 gallon / 4 quarts / 16 cups; height 10 inches, diameter 6 inches; cloth cover 8 x 8 inches; lid is plastic as it is not good to use metal lids for kombucha scoby. UNLIMITED USES - No matter the use, our Gallon Jars can handle it. Use our large glass containers to brew and ferment kombucha scoby, kefir, sourdough starter, wine, beer, home brewing, pickling sauerkraut, carrots, pickles, homemade apple juice, grape juice, ice tea, salsa, fruits, pickles, vegetables, syrups, sun tea, sauces. Also great to store items such as sugar, flour, rice, oats, cereal, tea leaves, coffee beans, lemonade, candy, and anything else you can think of! 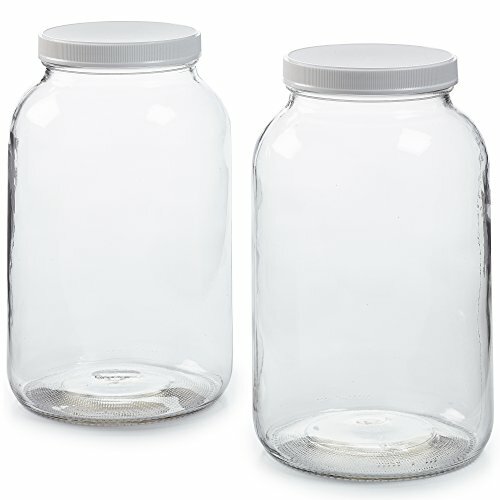 1 GALLON GLASS JARS - You will receive (Two) One Gallon large glass jars with Two plastic airtight and leakproof lids. Also included are Two 7" rubber bands and Two sheets of 8"x8" muslin cloth that is breathable to let in air but keep out contaminants and bugs. This is the perfect kit to get started brewing Kombucha, Tea, and other drinks. *Scoby and other ingredients are not included in this set. HEAT RESISTANT UP TO 350ºF - Our 1 Gallon wide mouth jars are heat resistant up to 350ºF which means you can pour your boiling water right into it and begin brewing your Kombucha scoby, Sun Tea, or any other hot liquid without having to wait for the water to cool down. AIRTIGHT & LEAKPROOF PLASTIC LID - Unlike other sellers, our lid is high quality and will not break. The 100% BPA Free plastic lid comes with a removable seal to make it airtight and leakproof. It will also not corrode or rust like metal lids. 100% BPA and TOXIN FREE - Our large glass jars are USDA certified food grade which means that they are safe for all types of food and liquid. This is great because you do not have to worry about harmful chemicals coming into contact with your food or liquids. LIFETIME MANUFACTURER WARRANTY - If for any reason you are not happy with your One Gal glass jars, just send them back to us for a prompt and full refund. We are so sure about the quality of our product and that it will provide a lifetime of brewing, fermenting, and storing that we provide a manufacturer warranty against any and all defects that come from normal use.